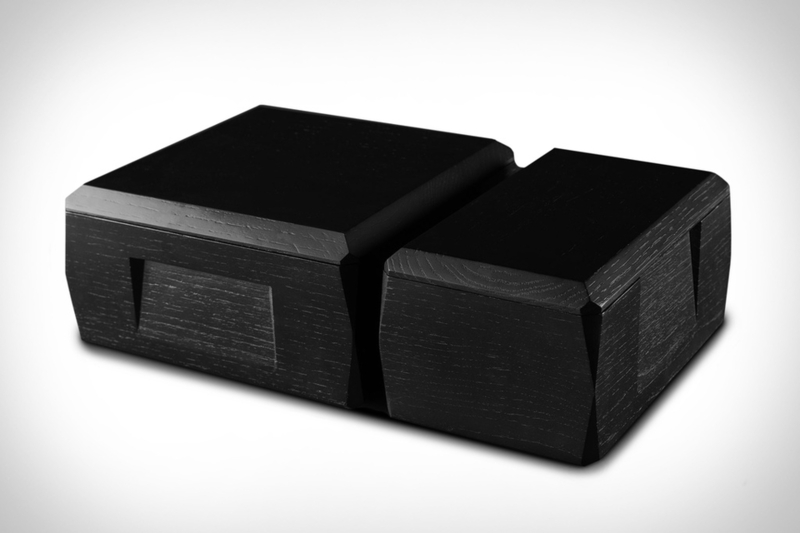 Just like their glasses, the Norlan Kist Case was meticulously developed over years. The piece is hand-crafted out of solid oak and finished with a smooth ebony stain. Available in two sizes, the Kist is designed as a ceremonial box for two or four Norlan Whisky glasses, each glass held in place by an individual silo and protected by a dusty white, laser-cut leather lining. The lid fastens with rare-earth magnets for secure transporting but also removes to create a bar top display. Rabbit, or RBT for short, continues to put out some of the finest barware around, and now they have made the same sophisticated aesthetic portable with their just-released steel flask. Utilizing the same black-and-brass color scheme found on the stay-at-home collection, the sleek flask lets you stash a bit of booze in style. The translucent lid is held neatly in place on the base of the flask when taken off, and the 6.75-ounce capacity is more than enough to get you through. If you haven't sipped whisky from a Norlan Glass, you're missing out. The glassware enhances the nosing and tasting experience, likely convincing you to discard other glass options permanently. And now they have a brand new addition to their collection with the VAILD Glass. When whiskey is poured, a brilliant golden glow radiates from within the concealed inner glass, producing an infinity mirror effect. The VAILD has a beautiful black matte finish on its outer wall, and is based on the design of internationally recognized designer Sruli Recht and refined with the help of master distiller Jim McEwan. They perfected the glass over 90 different iterations for a whisky drinking experience like none you've had before.